I didn’t try to patch the leaking river, I ripped out the whole thing and rebuilt it. 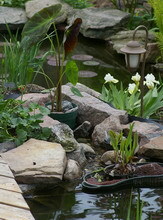 More room for shallow water plants and a ledge in the upper pond to hold a plant and a small filter box. The big fancy filter systems that they sell now for ponds, just were not available, when I built mine so I have incorporated a couple of passive filters in the rivers and waterfalls. They must help because they certainly get filled with ‘gorp’ very quickly. Rinsing them out, is now another job on the list but the rinsed out ‘gorp’ feeds the nearby beds with lots of nutrients. Celebrated the rebuild by going to the garden centre and buying a few things, mainly a gorgeous, dark leafed, Colocasia antiquorum imperial The picture shows the planter and filter box in the foreground and the Colocasia standing about 50cm tall in the middle of the new river. The best news is that I appear to have fixed the leak. Strange things happen in gardens. 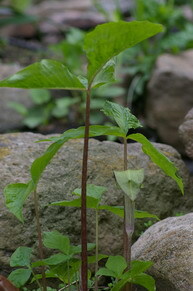 Under the Crab Apple, beside the river, a Jack in the Pulpit, Arisaema triphyllum appeared this week. I remember putting in a couple of bulbs a few years ago and they appeared once and I haven’t seem them in a couple of years but this week they, suddenly and very pleasantly, reappeared. Where were they?? It is a delightful, moist woodland, native plant that evokes, for me, childhood hikes through the woods and I’m thrilled that it has decided to return to my pond area. I wish I knew what I did to make it happen so that I could be sure to repeat the process. I will garden until forever and I will still marvel at the vagaries of Mother Nature. I received today, another of those, “open immediately” packages. Inside was a nicely dormant rose bush with four good strong stems. Teasing Georgia is one of the roses developed by the British rose breeder , David Austin, who specializes in older style, heavily petalled and scented, English roses. This rich yellow climber was given to me by the David Austin Company, so that I might trial it. It won the Henry Edland medal as the best scented rose in 2000, so I’m looking forward to seeing how it performs here in a somewhat harsher climate. I’ll keep you all informed of its progress. 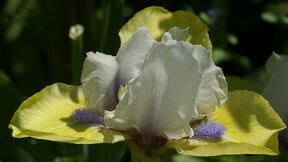 Most of my standard dwarf bearded Iris are blooming this week. They are about 12" / 30cm tall and have some wonderful colour combinations that don’t appear in any of the other groups of Iris. The picture here of Secret Prince, gives you some idea of why I spend so much time and effort on my Iris. I spent part of the weekend cataloguing my collection and continuing to photograph those that are in bloom. I have done most of the back yard and have so far detailed in excess of 60 varieties. I know that it appears to be a bit of an addiction but there are worse addictions. I’m trying to do a little record keeping, not my strongest suit. With the Iris, Peonies and Daylilies, the “Three Tenors” of the perennial garden, as I call them, I’m recording first bloom dates etc. because it is interesting and it gives me an excuse to just wander around the garden with my clipboard, each morning, taking the time to just notice and appreciate what is happening. Something we gardeners often forget to do. I curse and swear at the pretty blue flowers in this last picture because they are attached to a most invasive weed. 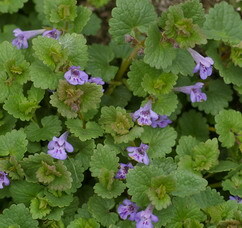 Glechoma hederacea known as Ground Ivy or Creeping Charlie, invades my few areas of grass and will rapidly make a solid ground cover in the vegetable garden. Hoeing it just seems to break it up and propagate it. I have just killed a large section of what was once grass and is currently mostly Glechoma and rototilled it this past weekend. The beds on either side will get larger and a gravel path will be created to wind between them. While researching the Latin name of this aggressive beast, I find that it is classed as herb and there are a variety of things that it has been used for over the last 1000 years or so. Apparently you can clarify beer or get relief from your head colds and stuffy noses with a hot infusion of this stuff. Maybe I was too hasty in my killing of it. Not to fear, it certainly has not been completely eradicated from my gardens. We remind you that you can ask questions by simply hitting the reply button on this newsletter and if they are questions of wide interest we may answer them here. Ken answers: Never! Those leaves, as unsightly as they may be, are absorbing the sun’s energy and regenerating the bulbs so that they will bloom bigger and better next year. If they are in a bed by themselves, just plant some tall annuals between the bulbs and they will grow and hide the bulb’s leaves as they die down. When the tulip leaves are dry and brown they should just pull out of the ground with a very light tug or if the annuals are hiding them by that point just leave them to decompose where they are. I always like a solution that appeals to my lazy side. Narcissus (Daffodil,) leaves will take a bit longer to ripen but they will eventually turn yellow and disappear below the annuals. If your bulbs are in a perennial garden all of this covering up and dying down should take place naturally. There are new articles on www.gardening-enjoyed.com about Peonies, lettuce and my variable salad recipe, along with other new topics. Be sure to go and have a look.